Last season, Joe Mauer took home the AL MVP after slugging 28 HR, 96 RBI, and a .365 AVG. It’s nearly indisputable that Mauer had one of the finest seasons ever by a catcher. Yet hardly any fantasy baseball idea is more controversial than the prospect of taking a catcher in the first round. Some people who blanch at Mauer as a high pick might be nervous about the inherent risks of investing in a catcher, the one position on the diamond (other than pitcher) where no player can every day, and where injuries and wear are big concerns. Others point to Mauer’s HR-to-flyball leap (from 6.5% in 2008 to 20.4% in 2009), seeing it as a clear sign that “Mauer power” is illusory. However, the best case for Mauer as a solid first-round pick has nothing to do with faith he’ll keep up the HRs. Nor does it have anything to do with batting average, his most famous advantage over other players. It comes down to another category in which he’s so spectacular, he holds the potential of helping a team go a long way toward winning it. That category is runs — probably the least-considered one in fantasy baseball. It’s also the category that’s been shown repeatedly as most correlative with a fantasy team’s hitting success. Competitors tend to dismiss the runs category, perhaps because they see it as outside of their control. A player crosses the plate, after all, not just based on his ability, but also due to other players’ ability to drive him in. However, it follows that getting on base is a skill, and that those who do it well score more runs. Over the last three years, only three batters with more than 600 at-bats (Albert Pujols, Chipper Jones, and Todd Helton) have gotten on-base more than Joe Mauer. The result is that Mauer crosses the plate a lot. Over the last three seasons, he’s averaged 85 runs scored. He scored 94 in 2009. In 2010, he’s projected to score 92 times. How valuable is that? Let’s put it in perspective. 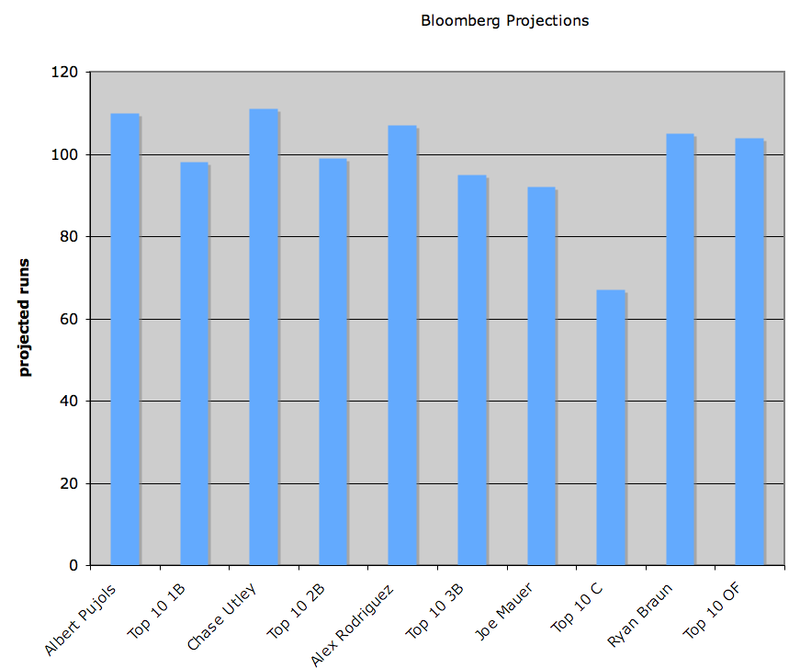 Going into 2010, Bloomberg projects Mauer to have a 25-run advantage on the top-10 leading run scorers at catcher. Is that a lot? Let’s look at how other players in the first round stack up in the runs category compared to the top-10 projected run scorers at their respective positions. As you’ll see above, Mauer (+25) holds a bigger advantage compared to his peers than Pujols (+12), Chase Utley (+12), Alex Rodriguez (+12), and Ryan Braun (+1). Perhaps it’s time we began to look at things differently. Maybe Joe Mauer is to runs as players like Carl Crawford and Jacoby Ellsbury are to steals. This may sound controversial, but after going through several drafts already this year, and then projecting the seasons out, I’ve typically found that the team in my league that drafts Mauer is usually the one projected to win the runs category — and give himself a huge leg up on a league title. For more information on Joe Mauer and hundreds of other players, check out Bloomberg Sports’ fantasy tools.